Network Capital: Also referred to as Customer and Supplier Capital, this is where strength and loyalty of customers, suppliers and other business relationships will start bringing in cash flow and other factors that will contribute to future growth. Intellectual Capital: Knowledge that can be used to create value. Intellectual Assets: Codified knowledge that can be used to create value. Intellectual Property: Legally protected intellectual capital. Assessing risks involved in protecting the enterprise’s intellectual assets (or structural capital) and using an effective intellectual property strategy to minimize business risk. 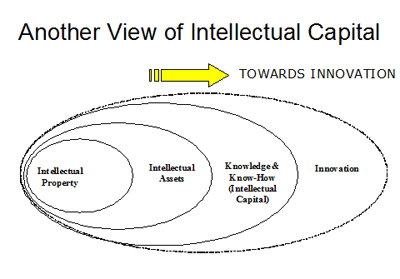 Intellectual Capital Management links scientific and technology R&D, innovation and intellectual property rights in a holistic management concept. However, it is not just technology oriented companies that will benefit from ICM. The capitalised value (i.e. stock market value) of many global companies such as Coca-Cola is many time above its fixed tangible assets and the only way to explain the difference is the intangible assets such as the brand name and business processes owned by the company. Mainland China is beginning to realise that it has lost many of its historical brands and has been encouraging the development of “Self-initiated Brand Names” since the inauguration of the 11th Five Year Plan (2007-2012). There have also been many Asian cases, such as “Esprit” of Hong Kong and “Red Bull” of Thailand that made extremely smart use of ICM (but not necessary a lot of scientific and technology research) to take the great leap from being local brands to become globally recognised brands. ICM, particularly the creation and use of intellectual property (including registered trade marks from which brands are built) is the foundation on which knowledge economies of the world are built upon and a fundamental business management tool enterprises need to harness as they move down the road of innovation and creativity. Original concept developed in the 1990s by early ICM practitioners such as Sullivan, Edvinsson and Sveiby building on earlier work in Japan by Hirojuki Itami . At one stage, Shanghai Toothpaste leased a 38 year old brand name of Maxam Tooth Paste to Unilever as a form of cooperative joint venture but later reclaimed it in 2001, claiming deliberate attempt made by its business partner to down-play the Maxam brand that results in market share loss.